July 20, 2016 - "Press Releases"
Joseph Henry and Michael Faraday, working separately and on different continents (Henry in America, Faraday in England), simultaneously discovered the principle of electromagnetic inductance, the ability of an electrical conductor to generate electromotive force when the current running through it is changed, in the 1830s. Faraday later built a rudimentary inductor and, not long after that, Irish Reverend Nicholas Call and built the first true inductor. Today, inductors are one of the core building blocks of modern electronics. As such an important component of any electronic application, it is important to have a basic understanding of inductors and their basic functional and operational principles. Inductance is, naturally, the primary feature of inductors. Variation in a current (like in an AC current) that is flowing through a coil will alter the magnetic field of the coil. The magnetic field change induces a second current in opposition to the original current — this is inductance. The magnetic field formed by an electromagnetic coil, including inductors, is capable of storing energy. This energy is stored in the form of flux, represented by lines in a magnetic field, known as maxwells. The flux of a coil is directly related to its inductance. Put simply, permeability is a measure of how easily a magnetic force can pass through a solid medium. More accurately, permeability is the ratio of lines of force of a medium to the lines of force of the medium’s magnetic field. Inductors naturally have ohmic losses, which are reductions in current due to the natural resistance of coil materials. An inductor’s time constant is the number of seconds it takes for an applied current to reach 63% of its full value. Since our founding over 70 years ago, Triad Magnetics has been a leading manufacturer of world-class quality magnetic components. We put more than half a century of experience to work not only to manufacture magnetic components, but to help enrich the industry by providing valuable educational resources. 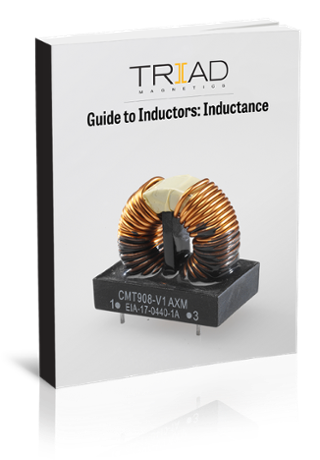 One of those resources is our “Guide to Inductors: Inductance” eBook* — in it, you’ll learn more about inductance, flux, permeability, and time constants, including helpful equations. *This four page eBook is the first in a three part series focused on inductance. The eBook is meant to be a brief introduction to the history and concept of inductance and not meant to be an educational textbook.